Rita Pavone (born August 23, 1945 - Turin) is an Italian ballad and rock singer who enjoyed success through the 1960s. Pavone is also an actress. She participated in the first Festa degli Sconosciuti ("Feast of the Unknown"), a prestigious television competition, in 1962, winning the contest. Her self-titled 1963 album, led by the hit single "La partita di pallone" ("The Ball Game") made her a national star at 17, and international attention soon followed. In 1968, Pavone married the contest's organizer, the also well known Italian singer Teddy Reno. In 1965, Pavone participated as a musician guest in The Ed Sullivan Show, becoming a frequent guest there until 1970. Meanwhile, Pavone scored a string of hits, both with ballads and rock songs, in Spain, where she became a teen idol. Pavone enjoyed so much fame in Spain that it was commented, during a 2005 television documentary from that country, that such success for a foreign singer there is indeed rare. Rita Pavone in the United States sang alongside Diana Ross and The Supremes, Ella Fitzgerald, Tom Jones, Duke Ellington and a number of singers of the era. It is said that Elvis Presley made a painting of her after she went to Memphis and he met her at a recording studio. Barbra Streisand recorded a duo with her. Pavone sang at Carnegie Hall in New York city during this era. Returning to Italy, she made her debut as an actress, working in five films and participating in shows such as Giornalino di Gian Burrasca (a children TV show), Alta Pressione, Stasera Rita ("Tonight Rita") and Studio Uno, a variety show. In 1982, she participated in Come Alice ("Like Alice"), which became a hit in Italian television. Rita Pavone starred in six movies during the 1960s; Clementine Cherie (1963), Rita la figlia americana (1965), Rita la zanzara (1966), Non stuzzicate la zanzara (1967), Little Rita nel west (1968) and La Feldmarescialla (1968). The two "zanzara" movies, together with the Giornalino di Gianburrasca (1965) were directed by Lina Wertmuller, who remains to these days one of Rita's biggest fans. Although her movie career targeted a teen audience and lacked great artistic value, her movies have found today a cult niche. Later on during the 1980s she would participate in comedy films, such as 2 sul pianerottolo, Risate in salotto and Santarellina. In 1992, Pavone returned to the United States, where she sang during a multiple artists concert that included Whitney Houston, Frank Sinatra, the Bolshoi Ballet and Cher at the Sands hotel in Atlantic City. She then turned to acting in theater, participating in a William Shakespeare play. In 2002, Pavone had a concert at Miami's Dade Auditorium. Pavone and Reno are still married, and now live in Ticino, Switzerland. They have two sons, Alessandro and Giorgio, both of whom have become involved in show business themselves, Alessandro as a radio show host and Giorgio as a rock singer. Rita Pavone was a Senate candidate in the Italian general election of 2006. She participated as candidate for Per l'Italia nel Mondo (For Italy in the World), a centre-right list, led by minister Mirko Tremaglia, which is present only in the foreign costituencies. Subscribe to Rita Pavone RSS Feed to get latest lyrics and news updates. 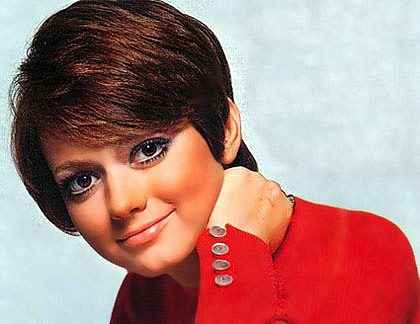 What do you think about Rita Pavone? Let us know in the comments below!